Taking inspiration from the outline of a military tank, the Cartier Tank watch has taken on a variety of designs since the very first “Tank Normale” was released in 1917. 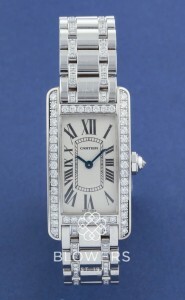 Popular models today include the Cartier Tank Francaise and the Tank Americaine. Viewed from above, the profile of the tank tracks provided Louis Cartier the inspiration for the unusual lugs which seamlessly integrate into the case, forming vertical bars, named brancards, granting a neat and stylish appearance. Released in 1996, the Tank Française watch features a metal bracelet which seems to effortlessly fuse with the watch case in sublime union. The bracelet links are concave and feature corrugated edges, again inspired by the treads of armoured tanks. The Tank Américaine was launched in 1980. It features some of the maison’s legendary design elements, including a blue cabochon gracing the crown, Roman numerals denoting the hours and a chapter ring positioned inside of the hour ring, termed a chemin-de-fer chapter ring. The case has a graceful curving line, accentuated rectangular form and rounded brancards. Since the release of the “Tank Normale” in 1917, Cartier has produced an array of eye-catching designs including the Tank Cintrée (1921), Tank Chinoise (1922), Tank Louis Cartier (1922) and Tank à Guichets (1928). 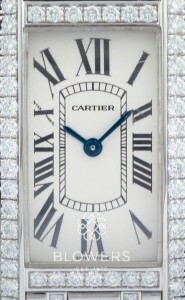 While each new design was unique, they all remained very obviously Cartier Tank timepieces. Cartier has enjoyed a long-term relationship with England and is linked to quintessentially British institutions such as the Cartier Queen’s Cup, a prestigious polo event held at Guards Polo Club. It, therefore, came as no surprise when the luxury brand chose to release the Tank Anglaise in 2012, celebrating its close ties to Angleterre. The model is available in a selection of metals, offered on both leather strap and bracelet and presented in a choice of sizes to suit male and female clientele. The appeal of the Tank has shown no signs of abating. Indeed, arguably some of the most iconic Tank designs have been released in the latter half of the 20th century.